This is the #10 post of my Scrapy Tutorial Series, in this Scrapy tutorial, I will show you how to write a real spider so that we can reuse the commands, tools we talked about in previous posts and the new spider would iterate the container, iterate over the pages so in the end, we could get all the quotes from Quotes to Scrape. Before starting to write code to the editor, we need to check the element in web browser to figure out the where the element is located, how the pagination work. This step is very important during the spider development. In Chrome, right click in the web page, then click the inspect, we can see a window popup in the browser, which is called DevTools. There are many tabs in DevTools, right now you can only focus on the elements tab, in this tab you can inspect all the dom element of the web page. For example, in a div which have class col-md-8, there are 10 divs which have class quote, then the author info and quote text are located in different span elements. After analyzing and testing, now we can use XPath expression such as //div[@class='quote']//span[@class='text']/text() to get the quote text and //div[@class='quote']//small//text() to get the author info. After we get the XPath expression of the target information, now we can start to test code in Scrapy shell. We can enter scrapy shell to enter the Scrapy shell first. 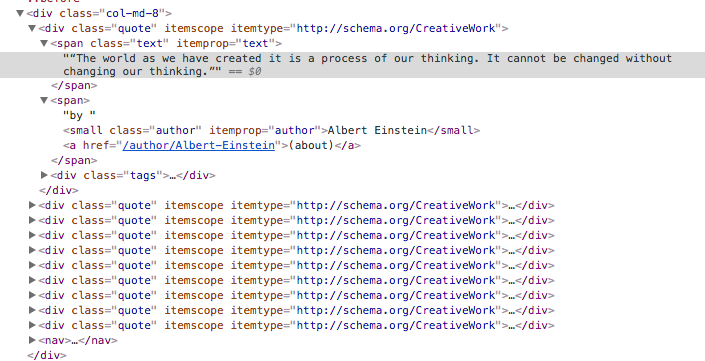 Then use fetch("http://quotes.toscrape.com/") to fetch the Html page. The best way for newbie developer is to write code in your editor, and then paste the code block in Scrapy shell to see if the code can work as expected. For example, you can copy the code block below and paste in scrapy shell to check the output. If you have installed IPython, then your Scrapy shell would have some magic commands to help you get job done effectively, one command you must know is %paste, this command would paste multi-line code from clipboard to scrapy shell, which is very convenient. In the terminal, if the code can work as expected, then you will see the quote and author info printed in the terminal, which means the code is right. We can run the spider scrapy crawl quotes_spider to check the output, The spider can extract the quotes and author info for us now! 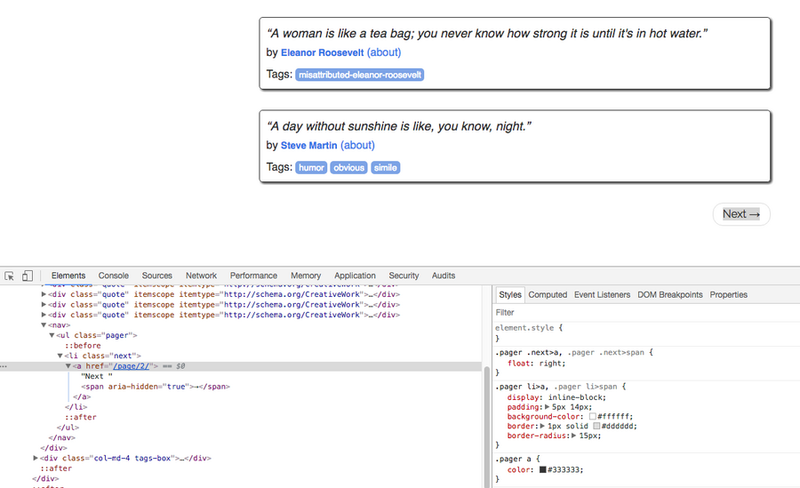 To solve the pagination problem, first, we inspect the Dom element in DevTOols to figure out how the pagination work. As we can see from the screenshot, the next page button is actually a HTML hyperlink, which means if we just follow the URL of the link and extract all data from the URLs, then we can get all quotes. We can extract the URL of the next page at the end of parse method, send a new HTTP request to scrapy, so it will automatically help us get the response, when the response is available to handle, parse method would be called again to process the response. What you should know is that parse here is named callback function because this method is used to handle the response. If we do not set the callback function in the Request, then the current method would be used as callback function. The first requests to perform are obtained from start_urls, here the spider start from http://quotes.toscrape.com/. When http://quotes.toscrape.com/ is downloaded by Scrapy, the default callback function parse is called, spider extract the data and yield back to Scrapy, and find the URL of the next page http://quotes.toscrape.com/page/2/, yield a new request which has the next page URL, the callback function of the new request is still the parse function. When http://quotes.toscrape.com/page/2/ is downloaded, parse is called again, quote data are extracted, next page URL found, new request are yield back to Scrapy. The spider follows this pattern over and over again until it visits page 10 of this website. In that page, there is no next page button, which means spider will not find next_page_url, the value of next_page_url is None, so spider would not yield new request to Scrapy. The whole crawl process would end here. 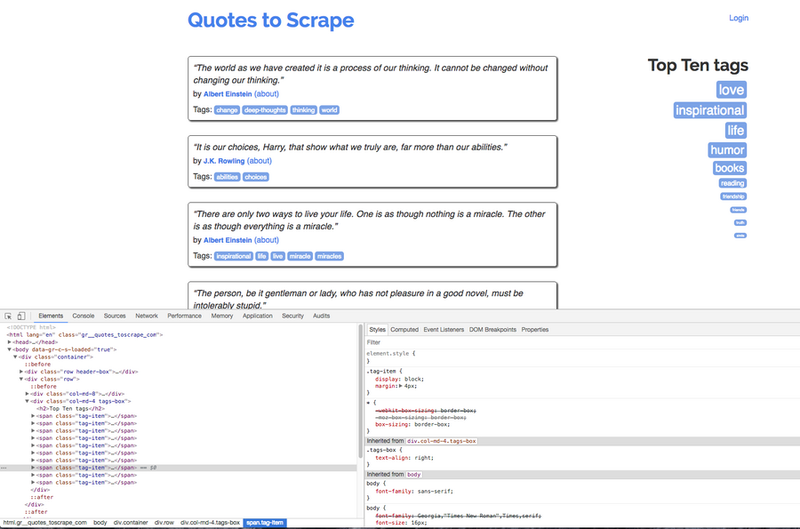 Now we can run scrapy crawl quotes_spider to make the spider crawl all the quotes and author for us, below is part of the log. From the log of the terminal, you can notice that the data of page 1 is crawled first, then page 2, page 3, the spider has been closed after visiting page 10.